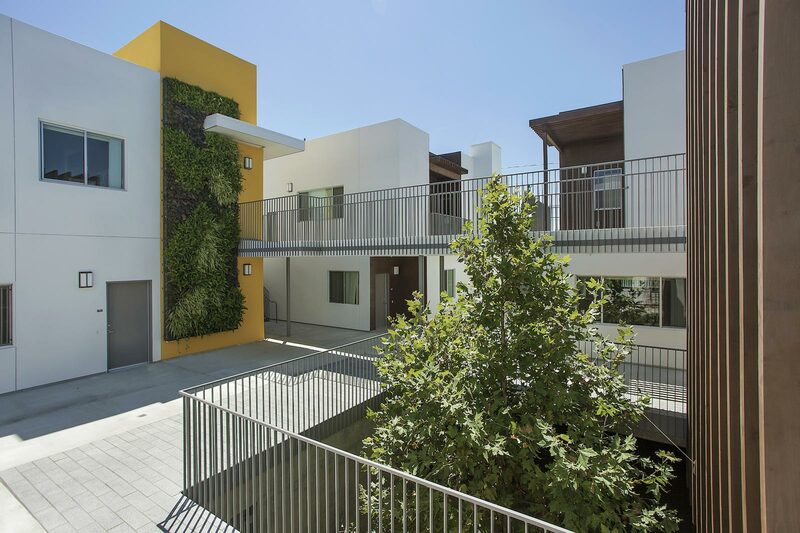 This twenty-unit affordable housing project was developed through a partnership between Burbank Housing Corporation and the City of Burbank. 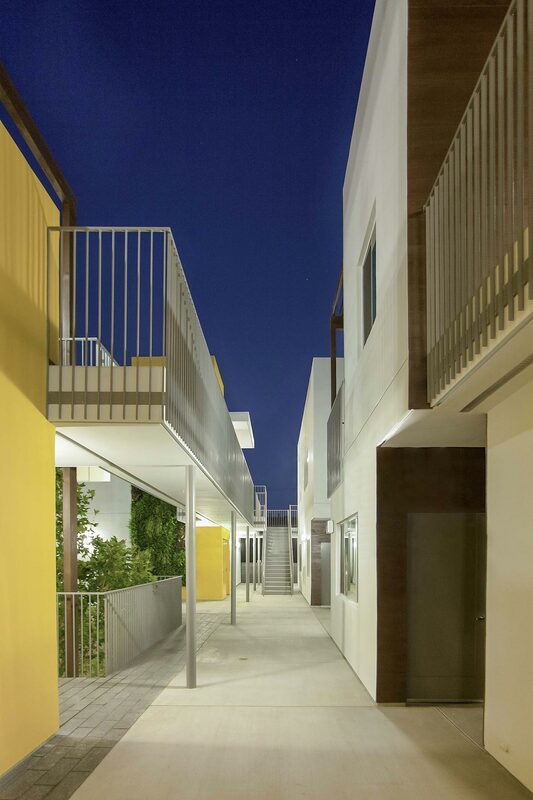 Set in a mixed single-family and low-rise multi-unit residential neighborhood near Burbank Airport, the complex on Catalina Street distinguishes itself through its sensitive handling of light, landscape, scale, and open space. The Sycamore strikes a balance between the increasing need of density and respect for the modest scale of neighboring dwellings. 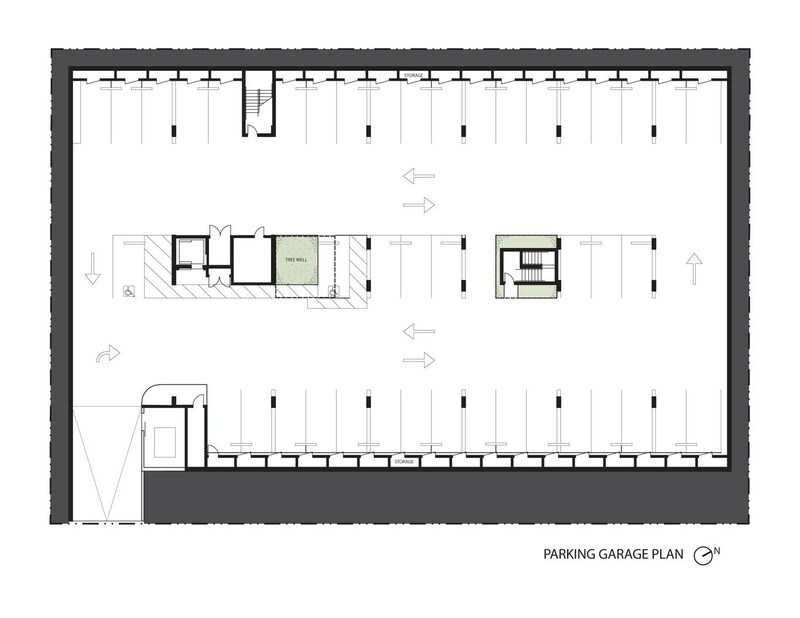 Broken into five volumes of housing atop sub-grade parking - yet well below the allowable height limit – the two-story project employs a warm, “domestic” material palette. Though the syntax is modern, the use of wood, smooth finish stucco and stone paving evoke Mission Era garden courtyard architecture. The main pedestrian entrance, the “Garden Gate,” is centrally located under an open wood pavilion, while the parking entrance is adjacent to another pavilion named the “Porch.” The wooden trellis motif is repeated over the balconies of individual units to add a vertical rhythm to offset the horizontal expanse of the building. 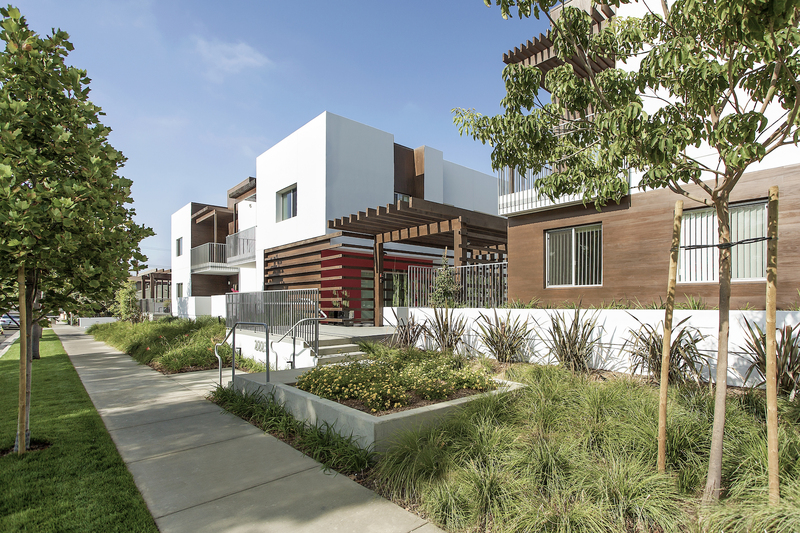 The pavilions and trellises not only bring human scale to the complex’s street elevation, but they facilitate and signify the transition from public to private spaces. The Garden Gate and the Porch are flanked by Bougainvillea-hued red walls, intensifying their interaction with the street. 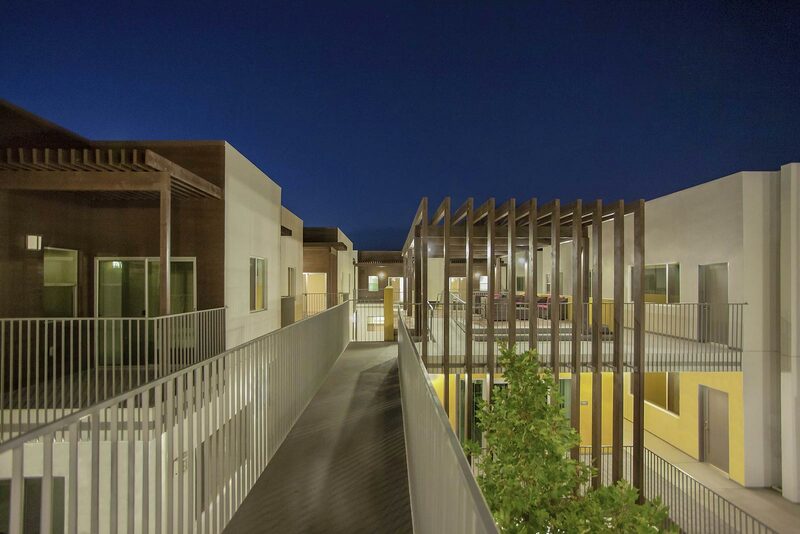 Sunflower yellow distinguishes communal elements such as the Community Room and the trellised sitting area above it, while wood cladding is generally found where people most closely interact with the building, such as their private entrances, stairways and balconies. 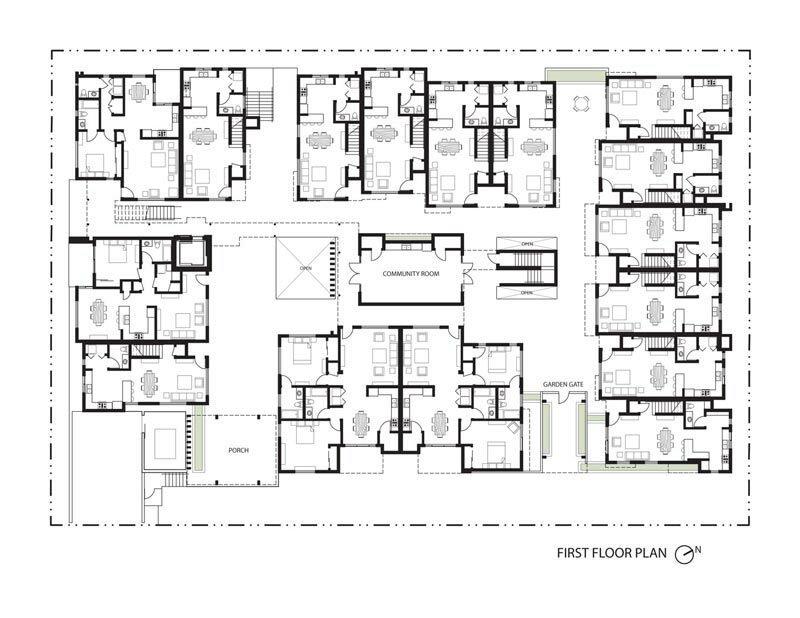 The progression of public to private spaces continues within the units, as in true garden-apartment fashion, each unit’s entrance and living areas face the courtyard, with bedrooms oriented around the perimeter. This not only enhances security but hopefully contributes to the sense of community in The Sycamore. 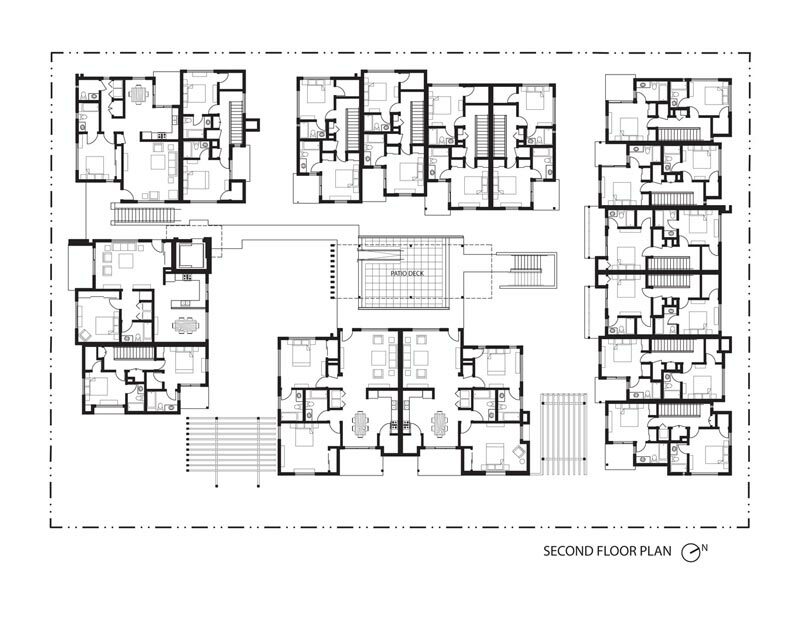 Communal areas within the courtyard also benefit from a carefully choreographed balance of light and shade. 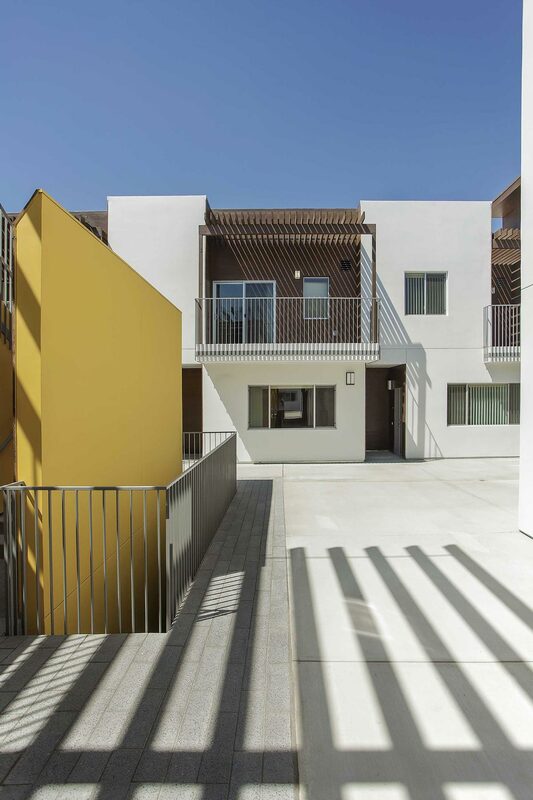 The garden apartment design allows for ample natural lighting and cross-ventilation, while necessitating protection from the brilliant San Fernando Valley sun. 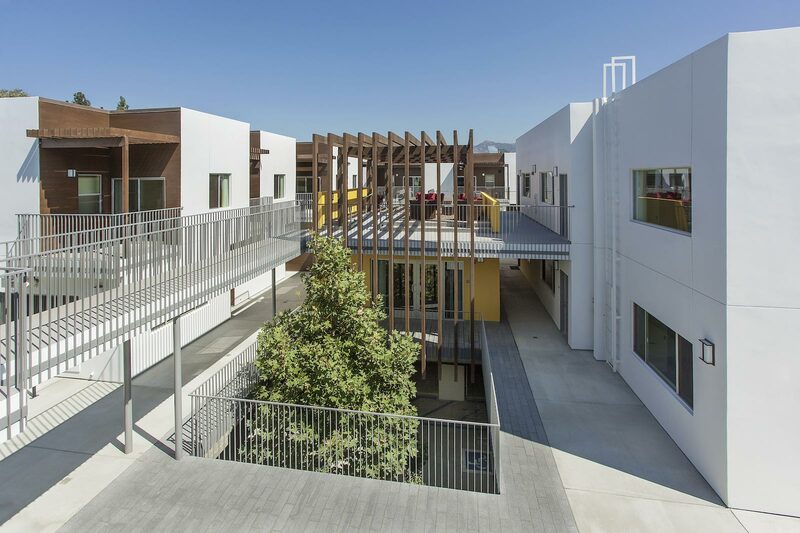 The courtyard screens units from direct sunlight while allowing for diffuse natural light, while trellises and vertical architectural fins protect the Community Room and other gathering areas from prolonged exposure to the sun. Such sustainable features as a bio swale, bicycle parking, solar panels, electric car charging, energy efficient appliances and more, combine with guiding principles of cross-ventilation, natural light, privacy, views, ease of circulation, and security will forge a very livable design. 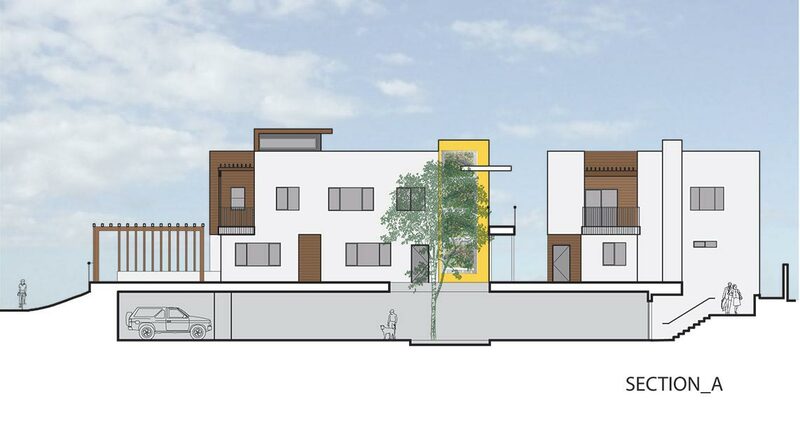 That this project affords such a high quality of life is a testament to the client’s mission, as manifested in a design that can be read from without, and experienced from within. As time goes by the architecture will yield more to the landscape. The trellises will be covered with colorful, drought-tolerant, and shade-giving Bougainvillea. The namesake Sycamore planted at parking level will grow above the height of the building. 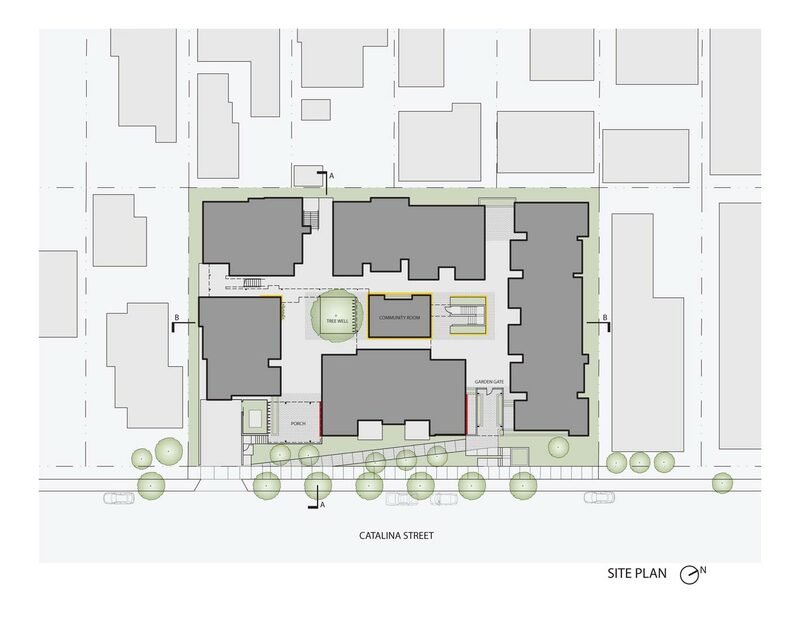 The street-side trees and plantings will mature, enhancing the privacy of the courtyard, individual units, and reinforce the notion of a garden apartment.